Plumeria blossoms (commonly known as the frangipani) symbolize life and birth. Additionally, they are known to symbolize unity and love. In weddings, they represent the birth of a new life of love. Elegant Plumeria invitations are a sophisticated blend of silver on white design that sets the tone for a traditional island wedding. The invitation card has lush borders of foil stamped, silver plumeria blossoms to provide an embossed appearance. Sheer velum invitation pockets hold the invitation in place and are secured by a sheer white ribbon with silver accents. 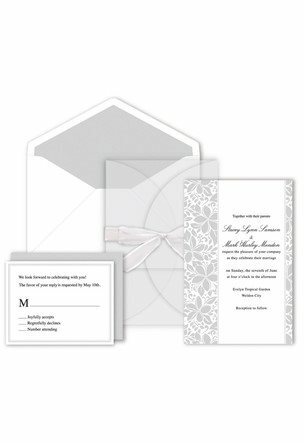 Outer invitation envelope is white on the outside accented with matte silver on the inside. Seal with a silver heart adhesive label. Reply cards have a beveled box border design in silver on white card stock, and corresponding silver envelopes.